I was recently present at an antenna and tower take down. I observed that the people climbing the tower were using a “Shockwave Lanyard” as a safety rope. This is a dangerous procedure. The shockwave lanyard is a folded up and sewn together lanyard. If one falls of a tower the thread is meant to break thus slowing the fall of the climber. If this lanyard is used as a safety rope it is conceivable that the stitching may give away and the climber will find himself “falling” away from the tower. 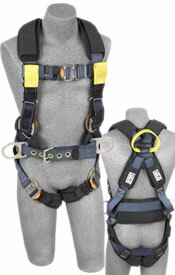 The lanyard above is clipped to the large D-Ring at the back of the harness. The lanyard below is clipped to the rings on either side of the belt. 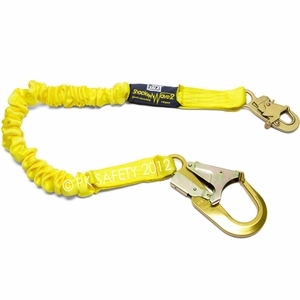 The lanyard below is a safety working rope. 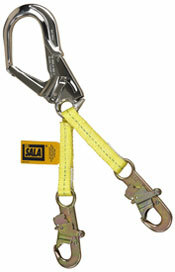 The large clip is clipped to the leg of the tower and the two smaller clips are clipped into the safety belt.